The Enkay RockTamers adjustable mud flaps system is the only adjustable and removable mud flap support system. The center hub attaches to most 2 inch and 2.5 inch ball mounts and the pivoting arms allow you to easily adjust the height and width to what you need. Easily secures to most standard 2 inch or 2.5 inch receiver hitch ball mounts and receiver hitches. These heavy duty mud flaps provide ultimate protection for towing boats, trailers, and fifth wheel trailers, snowmobiles, motorcycles, vehicles and more. The Enkay heavy duty rubber towing mud flaps are 24 inch by 24 inch and can be cut to any length. It's very easy to assemble with no drilling on your vehicle, and are easily removed when not in use. The RockTamer is available in black powder coat finish. Each kit includes a center hub with adjustable arms, custom-molded 24 inch by 24 inch rubber mud flaps, solid 4130 steel support rods, and a package of required hardware. The Enkay RockTamers adjustable mud flaps fit compact mid-size, full size vehicles and dually pickup trucks as the width adjusts from 66.75 inches to 93.75inches and come standard with stainless steel tips. Ball mounts and receiver hitches are sold separately. RockTamers mud flaps are warranted to be free of obvious manufacturing defects. Any damage caused in installation or maintenance is not covered by warranty. 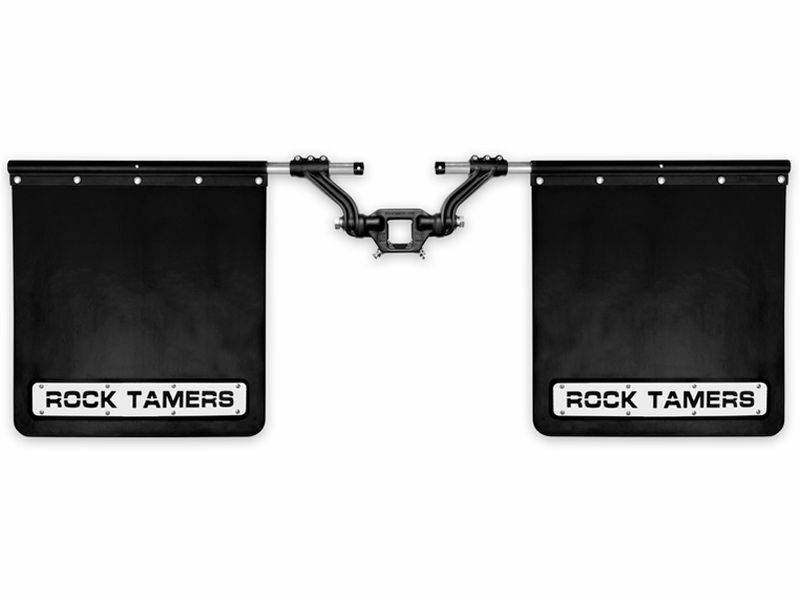 Rock Tamers mud flaps have an easy at home assembly and installation. Each mud flap system includes, mud flaps, supporting system and hardware for mounting. For additional information call 1-877-216-5446 or 701-253-5906.